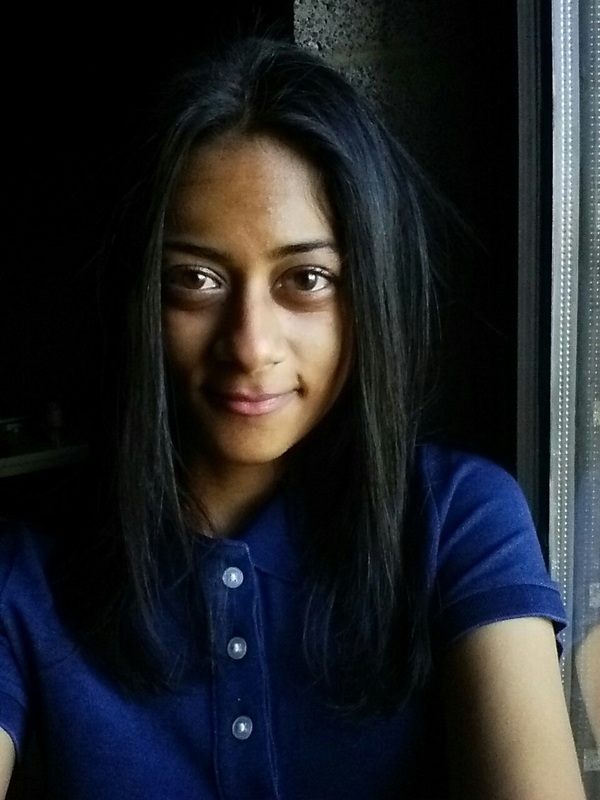 Anika Hazra was a Master’s student in Ecology and Evolution, studying Acacia-ant interactions in restored forests. She was an editor and founding member of The Science Cafe and defended her dissertation in March and graduated in May. This interview was held just after she had graduated and has been edited for clarity and brevity. For my Master’s research, I studied the interactions between Acacia trees and the mutualistic ants that live on them in a restored tropical forest in Mexico. How would you explain your research to your grandmother? To my grandma? My grandmother doesn’t speak English so I don’t know [laughs]. I can’t even communicate with her! I would explain it like this. 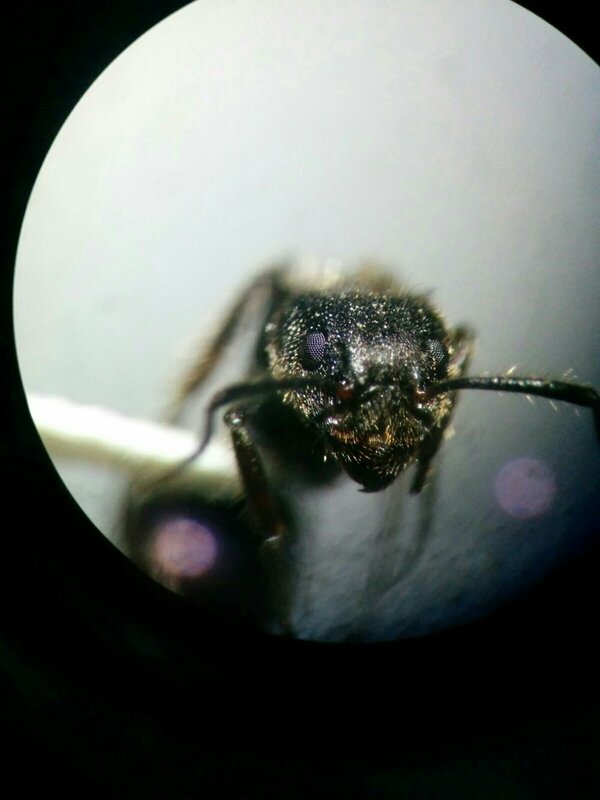 Grandma, I look at how ants interact with plants in a restored forest. A restored forest is one where the trees have been previously cut down, but people plant trees to artificially restore it. One way to tell if this restored forest looks and acts like a normal forest is by seeing how the stuff in it interacts with each other. So I’m looking at how ants interact with plants inside these restored forests. Could you explain your research in detail? There are these tropical trees called Acacia trees which have developed a mutualistic relationship with certain ants where the tree will give the ants food (nectar and Beltian bodies) and shelter (hollow thorns), and in return the ant will protect the tree from smaller things. But because the nectar, Beltian bodies, and thorns are freely available, they are vulnerable to exploitative ants. 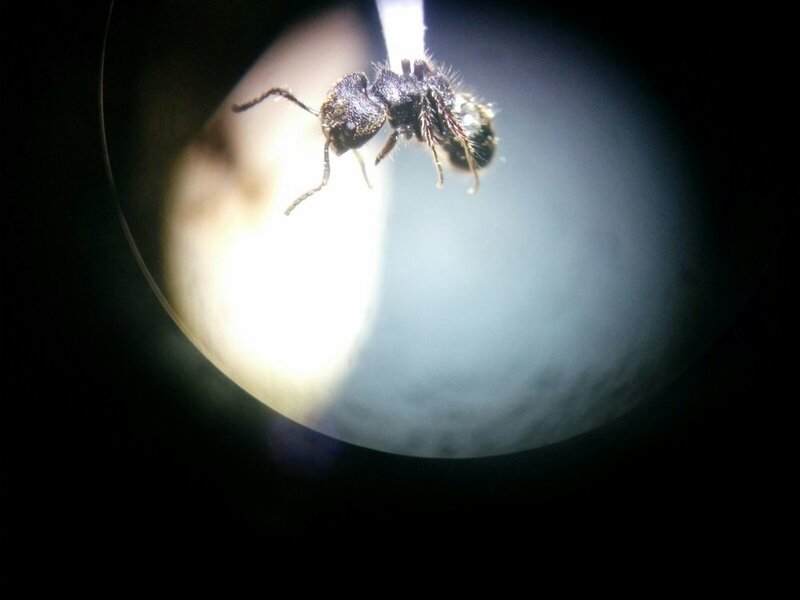 For my research, I was looking at the factors influencing what kind of ants are found on the Bullhorn Acacia growing in my lab’s study site, a bunch of smaller, artificially restored forest fragments. The acacias that I found were in three different states. There were the smallest ones, and not a lot of those were occupied by any kind of ant colony. This was intriguing because the Bullhorn Acacia needs to be occupied by a mutualistic ant colony pretty quickly to be protected from herbivory and survive to reproductive maturity. Then the mid-size ones were mostly occupied by an exploitative species called Pseudomyrmex gracilis. It’s larger, it’s black but sometimes it has an orange pattern on its body, and it’s not aggressive at all. I remember touching Acacias and having these ants crawling on my bare hands; they wouldn’t sting me at all. And then the tallest Acacia trees had the mutualistic species called Pseudomyrmex ferrugineus. It’s smaller than P. gracilis with a reddish-brown color, and they have really large colonies with lots of individuals – hundreds, maybe even close to a thousand. They are super, super aggressive. I think I’ve only ever been stung by them twice, and that was the worst day of that field season. It was like a stinging, scorching pain. From one ant! So yeah, I was trying to figure out the factors influencing what kind of state an Acacia is in. Is it just the size or the age? Is it where the Acacia is found in a fragment? Or maybe something else. Why would you say this research important? It’s important to know if restoration can work properly, if a restored forest functions just like an older forest that wasn’t disturbed or cut down. Older forests tend to support a lot more wildlife and diversity. So can we help conserve wildlife in areas where land has been degraded or destroyed? There’s a lot of farmland, especially in the tropics, where the soil is so used and abused that nothing is going to grow on it anymore. You have all this abandoned land that could be restored back to its natural state. That’d be really helpful for wildlife and especially for endangered species that don’t have anywhere to live. What got you interested in ecology? I just kind of fell into it. When I started my undergrad, I was actually initially an English major. I wanted to be a writer of some sort, maybe a fiction writer, but I realized it’s very unlikely that writing is going to work out for me. So I decided to do two majors, one in English and one in science, to have a backup. I thought “What’s the easiest scientific field I can think of?” Oh, environmental science [laughs]. But I remember looking at the courses under that program, and they were things like waste management, environmental policy, soil toxicology, things I wasn’t really interested in. But on the course calendar, I saw Ecology and Evolution just before environmental science, and I found courses like animal behavior, conservation biology, evolution, the stuff I actually like. So I started as a double major in Ecology and Evolution, and English. I liked all my classes, I liked all my professors, I liked my classmates, I liked the course material so much that I decided to go all the way. I kept English as a minor but decided to do science for real. What drew you to tropical ecology? So as you were choosing ecology and tropical ecology, how did you choose UIC? Initially, I wasn’t thinking of applying to grad school outside of Canada, but at that time, our prime minister was Stephen Harper who was very anti-science and cut funding to a lot of scientific institutions. A lot of the people I was emailing didn’t have the funding to take on new students. So I thought to look in the US and apply to NUS [National University of Singapore]. For the US, I was thinking of places where I wanted to live. I wanted to live in a big city, and the top three cities in the US are LA, Chicago, and New York. I don’t want to move to LA. I’m not a West Coast hippie, kale-eating kind of person. I really thought about New York, but I didn’t know if I can handle it. It’s the biggest city, the Mecca of all big cities. But I did want to go there. And then I was like “Okay, Chicago is something in between.” So I did a google search for something like ‘Chicago Conservation Biology’ and my advisor Hank Howe popped up. We sent some emails back and forth, and he told me about his restoration site in Los Tuxtlas, Mexico. It was perfect. It’s super applied with real world consequences for this research. Also, when I came to UIC to visit for the open house and met the lab, I liked everything I was seeing, I liked the people I was talking to, I liked the vibes. I’m like I should come here and try a PhD and see how it works out. So I gotta ask. Toronto or Chicago? I’m going to say Toronto because that’s where I was born and raised. I didn’t learn to appreciate Toronto until I started travelling. It’s a really big city, and yet it’s really safe, clean, and efficient. And then people are polite [laughs]. It’s a beautiful city. There’s always something to do, and there’s a lot of culture in the city. Living in Toronto has been a great way for me to meet people from and experience other cultures. So I would say Toronto, but there are great things about Chicago too. It’s not very different from Toronto…but it is different. I would say people are what make Chicago different. People vibes are better. They are a lot more laid back, a lot more open, a lot friendlier. Canadians in general are very meek and reserved especially in a big city like Toronto. Chicago is also great for comedy which is great for me because I love live comedy shows and live shows in general. Another difference is that Toronto is a really rapidly developing city. Every time I go back, everything seems different. Last time I went, I felt like a tourist. But Chicago is cool too in a different way because of its history. Even if you go to a diner, you could tell that it’s been around for a really, really long time and maybe it’s been owned by the same family that whole time. It’s really cool to see that history. So now you’re off to scicomm and science writing. Yeah, I knew from the beginning that I wanted to go into science communication after graduating. After two years of being bored with my research and spending a lot more time on science communication hobbies, I finally reached a point where I had to make a decision: do I stay here and try to finish the PhD over the next couple of years and then start to pursue the career I actually want, or do I just end with a Master’s and start now? So I made a decision to switch last semester, and then this semester I finished up, wrote my thesis, defended, and am now graduating. And in the fall, I’m going to enroll in another Master’s in science journalism at NYU. Let’s say somebody wants to do a Master’s, they just didn’t think a PhD was right for them, but they were having doubts. What sort of advice would you give them? You know for sure. It might take you a while to get there, to really convince yourself, but you know. I knew for really long time that I should have done a Master’s instead of a PhD, but it took me a while to come to terms with making the actual decision. It’s just a matter of time to feel confident in your decision. Talking to people might help or it might confuse you even more so just pay attention to what you really enjoy doing and if that happens to be research, there’s your answer. If it happens to something else…there’s your answer. So now off to New York, off to NYU for graduate school. Are you excited? I am! It hasn’t sunk in yet because it’s still so far away. The program starts in September and we’re in May now, so I have a whole summer before it actually gets started. My brain has shut down because I just defended a thesis and I don’t want to think of anything. I just want to enjoy my summer. I will be excited when I realize I’m moving to New York and that I’m doing this, I’m starting a whole other program. You’re going to be like Carrie Bradshaw. [laughs] Except smart. If Carrie Bradshaw had a background in science and wasn’t an idiot. But yeah, I’m excited to move to New York. I’m nervous, but I’m excited as well. I feel like it’s where I was meant to end up this whole time. I needed to grow and live in other places to prepare myself for New York. But I’m excited that I’m going to get the chance to live there for a bit. Maybe even longer.